Resilience is the ability to function well both mentally and physically in the face of major challenges, such as coping with a disability. It is the product of both personal factors (e.g., age when disability occurs or positive attitude) and environmental factors (e.g., education level or social support available). The Resilience Study aims to understand why some people with disabilities have achieved a good quality of life and are able to participate in their communities despite barriers they encounter. Through this study and its larger encompassing project, we seek to understand how personal and environmental factors influence community participation for people with disabilities in rural areas. With a greater understanding of these factors and how they interact to create resiliency, service providers can take advantage of naturally occurring strategies to develop targeted programs and policies to increase quality of life and community participation for their consumers. 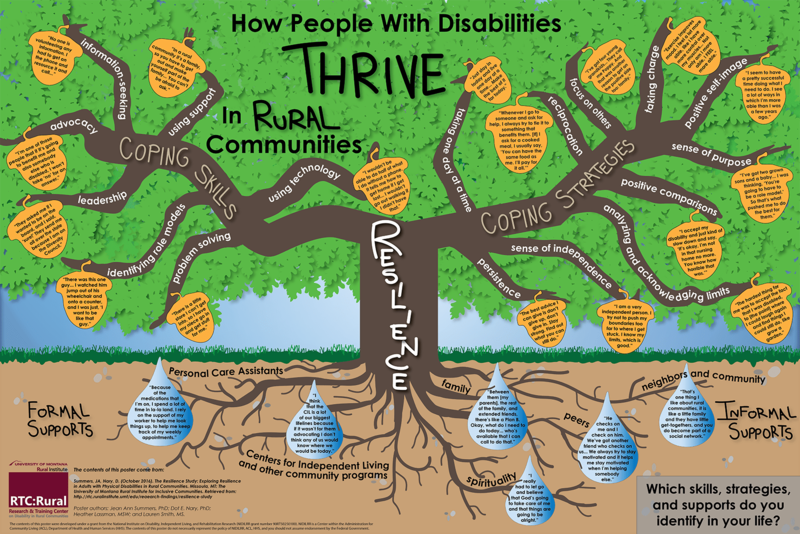 How do rural people with disabilities identified as “resilient” cope with everyday stressors associated with having a disability? What personal and environmental factors promote their resilience? What coping strategies and resources do they use that could inform development of interventions for others? We held two focus groups comprising rural consumers nominated by two Kansas Centers for Independent Living (CILs). The nominees were considered by the CILs to be living well and involved in their communities. A total of 17 consumers participated in the two focus groups. Nine males and 8 females were in the group, ranging from 22 to 68 years of age, with an average age of 51. Three participants reported as American Indian/Alaska natives, 1 reported Hispanic, 1 African American, 1 declined to identify, and the remaining 11 reported their race as white. Twelve of the 17 participants reported their primary disability was some type of physical disability resulting in a mobility impairment (e.g., multiple sclerosis, quadriplegia, back injuries); three reported a chronic disease that resulted in limitations to their daily activities such as COPD or cancer; and two reported their primary disability as a cognitive or affective impairment (autism, bi-polar disorder). The participants reported living with their disabilities for a range of 1 to 64 years, and many of them for 10 to 12 years. Of those with mobility issues, 6 reported using wheelchairs, 3 used canes, 1 crutches and 1 a walker some or all of the time. Three participants reported being employed, two reported volunteering in the community, one reported being a student and the remaining 11 participants did not report being involved in community activities, but cited much family and other informal community involvement. whether they had advice for other people with disabilities who want to live well in rural communities. External/environmental supports and resources include both formal and informal supports. Formal Supports mentioned by these participants were CILs and other community programs and Personal Care Attendants. Informal Supports include family, neighbors/community, peers, and spirituality. Internal/personal traits and beliefs comprise two categories of Coping Skills and Coping Strategies. Coping Skills include: positive comparisons; persistence; sense of independence; sense of purpose; focus on others; reciprocation; taking one day at a time; positive self-image and confidence; analyzing and acknowledging limits and self-acceptance; and taking charge and a sense of mastery. Coping Strategies include: advocacy; leadership; problem-solving; information-seeking; using technology; identifying role models; and using support. The information and understanding from the focus group participants will be used to create an interview guide for use in the next step of the project, which will be to have in-depth conversations with resilient people with disabilities to learn more about how they developed resilience. Many communities across rural America are far away from healthcare services. Rural residents with disabilities may not be able to get to those services to address their healthcare needs. This project will provide a consumer directed health program to people with disabilities in rural communities that allows them to follow their own needs and interests for health improvement. Participants will use tablet computers and work with local Centers for Independent Living in order to participate in the program. Healthy Community Living is a project to develop a multi-media health promotion program to improve people’s health and wellbeing that provides support, health promotion, education and opportunities for people with disabilities to succeed in reaching personal goals. It includes two separate curricula that blend in-person program delivery with online social engagement and website materials. The Collaborative on Health Reform and Independent Living (CHRIL) is conducting a nation-wide survey to understand how changes in health care reimbursement strategies affects working-age people with disabilities in terms of access to health insurance, and associated health care and quality of life outcomes. RTC:Rural is partnering with CHRIL to increase the rural representation in the survey and to answer rural-specific questions about health care coverage, availability, and quality of life. Living Well with a Disability is an evidence-based, peer-led self-management program that helps participants to set and reach quality-of-life goals by developing a healthy lifestyle. RTC:Rural provides training and certification for Centers for Independent Living (CILs) to conduct the workshops. However, not all people with disabilities who may benefit from Living Well are connected to their local CILs. By partnering with rural community hospitals and CILs, the Building Networks to Expand Living Well Delivery project will expand the reach of Living Well. Scaling up Living Well to rural hospitals will extend the reach of the program and improve the capacity of rural hospitals to support rural independent community living. Employment, social support, health status and the environment influence a person’s ability to deal with difficult experiences. These factors also have an effect on whether or not someone participates in their community. This study will focus on rural resilience to learn more about how people deal with difficulties associated with having a disability even as they participate in the rural community. Because many people with disabilities experience significant limitations in their ability to engage in community activities (e.g., shopping, entertainment, etc. ), we wanted to know how pain and environmental conditions affected participation in community activities. To help answer this question, we asked people with disabilities to complete 4 surveys over 18 months about their pain levels, environmental barriers, and participation in daily activities. About one-third of these people also completed six surveys for day for 14 days using an electronic diary that asked similar questions. We found that as people experience more fatigue and pain, their community participation decreased. In rural America, health management resources are not as available as they are in urban areas which makes managing complex health needs more difficult. One way of improving health status for rural Americans with disabilities is to use existing healthcare services that serve rural communities to promote effective health-related self-management. Many people with disabilities are institutionalized in nursing homes when they could live independently. Nearly forty percent of nursing homes are located in rural communities with limited access to services, family and oversight. Centers for Independent Living (CILs) have worked to move people from nursing home facilities into independent living situations with great success. Few people, once they leave a nursing home, ever return. People with disabilities have poor access to mental health services in rural areas, a gap that may be decreased through peer specialist services. Peer specialist providers offer a variety of services to people with disabilities and share similar experiences to those they are serving. They provide peer counseling, advocacy and can help in accessing resources. This project developed and offered a peer support training program to Centers for Independent Living staff and peers to help identify and provide support for mental health needs among CIL consumers. Results showed that people sought peer services when they experienced an increase in mental health symptoms which subsequently were reduced back to normal. When people with disabilities experience mental health symptoms, participation in community life can be reduced. This study surveyed people with disabilities in rural communities to see what kinds of mental health conditions they experience. Implementation of a peer specialist training curriculum for CIL staff and peers indicated that people experiencing elevated mental health symptoms presented for peer support. Subsequently, their symptom levels returned to normal. The Living Well with a Disability workshop is a ten-week evidence-based program designed to improve the health and wellness of people with disabilities. People who have taken the workshop report better health, lower medical costs and improved quality of life. Good nutrition can be facilitated and supported by organizing the home environment. This line of research describes methods for assessing the environment and the ways in which it promotes healthy eating. Health problems that come as a result of having a disability, such as high blood pressure and weight gain, can limit people from participating in life activities. This project focused on these secondary health conditions and led to the development of the Living Well with a Disability program. Living Well with a Disability Living Well with a Disability is a peer-led health promotion workshop that focuses on improved quality of life through the development of a healthy lifestyle. Training is available.